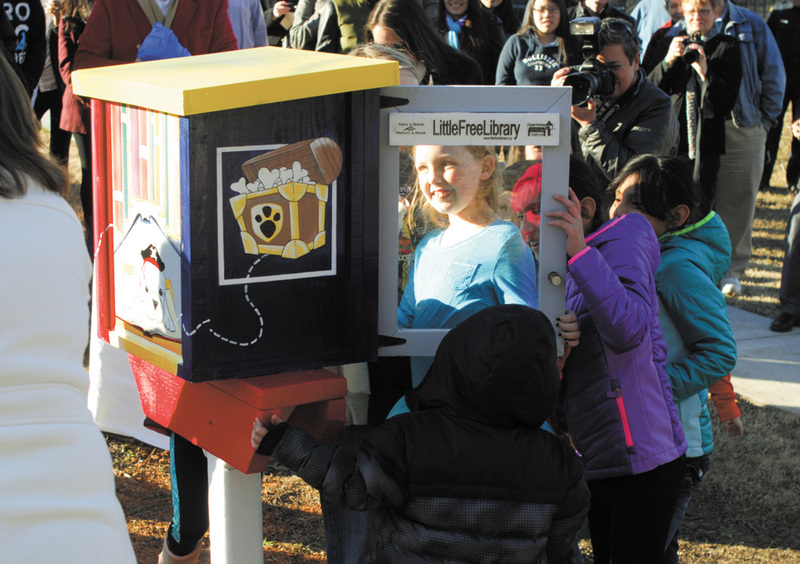 Arwen Coy, 9, takes a peek into the “little free library” unveiled at Briarwood Park on Jan. 16. The Cross Keys Foundation, a public charity that supports education in the Brookhaven area, was instrumental in opening the free library, which features a post-mounted, book swap unit. Kids now have more than a new jungle gym to look forward to when they visit Briarwood Park. On Jan. 16, officials unveiled a “little free library,” which allows kids to take a book or leave behind a book they’ve already read so someone else can read it. The Cross Keys Foundation said the Briarwood Park little library will be the first of 10 installed in parks around the city of Brookhaven. 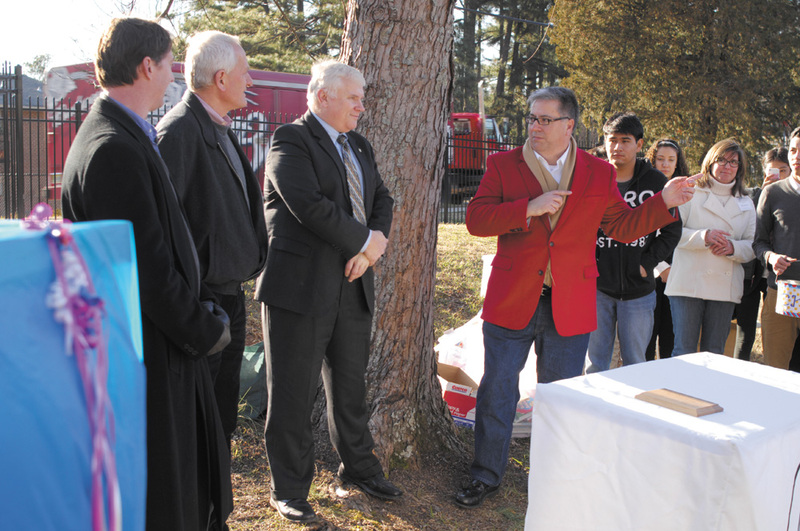 “Today is a great beginning, not just an event,” Cross Keys Foundation President Kim Gokce said as a group of children prepared to pull a cover from the new little library. Cross Keys Foundation President Kim Gokce, in red jacket, introduces foundation members, Brookhaven city officials, Atlanta Braves Foundation members and the Briarwood Park Conservancy to the crowd. The little library looks like a treasure chest, too. Cross Keys alumna and Agnes Scott College student Yehimi Cambron painted the sides of the little library with a pirate motif, including a treasure map and a dog in a pirate hat. Gokce said he wanted to combine the idea of the little free library, most often used as a way for people to swap books, with public education. The little libraries in the parks will contain children’s books exclusively in an attempt to reach kids at the parks, where they already gather. “We have a great deal of English language learners in our community, a lot of poverty in our community, and a lot of households where kids don’t have access to books or adults who are reading to them daily,” Gokce said. The Cross Keys Foundation is organizing the little library program, which is being funded by a grant from the Atlanta Braves Foundation. 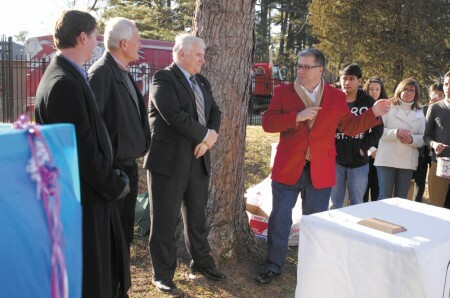 Officials from the city of Brookhaven, the Cross Keys Foundation, the Atlanta Braves Foundation and the Briarwood Park Conservancy were on hand for the ceremony, as well as students from Cross Keys High School. Dalia Alvarez, left, helps Edgar Remerez put up a donation sign. Cross Keys student Kedan Endrias said she thinks the little library will be good for the community. Vina Vo, a senior at Cross Keys, said she thinks the little library is a good way to get kids excited about books. 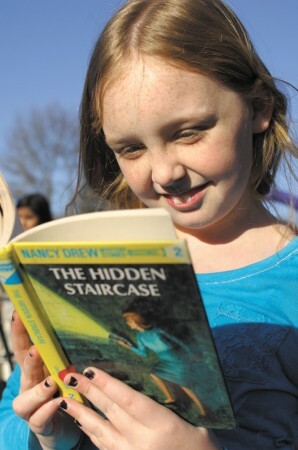 Arwen Coy, selects a book to read from the “little library” in Briarwood Park. The Cross Keys Foundation is collecting donations of cash and books to help keep the little libraries stocked. To contribute, email kim@crosskeysfoundation.org. This entry was posted in Uncategorized and tagged Briarwood Park, Cross Keys Foundation President Kim Gokce, the Cross Keys Foundation. Bookmark the permalink.